Hey everyone, Happy 2016! I've been taking some time the last week to recap and review how my 2015 went, and to sum it up it was excellent! Last year saw the culmination of years spent dreaming, reading, researching, and learning turn into a realized goal: become a successful mortgage broker. Changing gears and pointing my career in a new direction has been terrifying at times, but ultimately rewarding in so many ways. I have my clients to thank for the joy that you give me in doing my job. As with most things in my life, I give 110% when I am here and you support me with your smiles when the job is done and everything goes according to plan. Even when our best-laid plans are derailed I know I can count on that sense of achievement that comes from seeing a file through to completion, whether that be a new home, a refinance of your current home, or an expansion of your real estate investments. These are all substantial parts of your lives and I'm grateful to be a part of them with you! In my personal life, 2015 brought plenty of great things as well. A great year with my fiance, a new home, and lots of good times spent with family and friends! A ton of hard work and effort behind the scenes went in to making the good happen, and I can't thank my future wife and my friends and family enough for supporting me when it came time to put in work. 2016 will bring many more adventures and I'm eagerly awaiting them all: Our wedding in September(with tropical honeymoon to follow! ), and the massive renovation going on in our new home. In amongst all this I look forward to more enjoyable times with family and friends, and specifically to spending more time with my brother who has come back to Kamloops to pursue a new chapter in his own life. Thanks 2015, you were good to me! Congratulations(I think...) to one of Canada's largest financial institutions(I won't name names here...) on achieving "Record Profits" in 2015! Considering this has been a particularly uncertain year economically, they've somehow managed to buck the trend and keep right on growing. It's no surprise given their aggressive marketing tactics and their STEEP incentives(Read: IRD calculation HERE) to retain loyal customers. In their defense, they also have an extremely diverse portfolio of businesses and assets to manage, which allows them to minimize their exposure and risk to the more volatile markets in Canada. Now I'm not going to dumb this dialogue down to "We are getting ripped off by the banks" as @UncommonSenses so eloquently put it in the CBC News comments section, but is it not worth considering that if your bank is posting record profits then are they really your best deal? As one of the major players in consumer finances and mortgages, this bank plays a role in setting the standards and should act as healthy competition to the other banks, credit unions, and lenders. This role is particularly crucial given their massive marketing power, and their influence over their existing clients. I keep track of their mortgage offers quite closely and while on the surface they may seem to provide competitive rates, there is always a dark side(Star Wars pun intended, 18 days to go!). A great discussion of the drawbacks of a mortgage with the larger institutions can be found in This Article. What you need to know is that although the rates might be competitive, the terms and penalties are most likely not. And with a large number of homeowners considering moving or refinancing within their original mortgage term, the reality is that you need to consider the penalties. This could mean the difference of thousands or even tens of thousands of dollars later. When you're ready to discuss whether or not your bank is a good fit for your mortgage, take Yoda's advice and give me a call. Let's start the discussion. Or visit my website today to fill out a secure online mortgage application to get started right now. There are plenty of alternatives to consider that will save you money! Have you seen the movie Office Space? You know the one, where the guys devise a plan to 'skim' the extra decimal points off all of the bank transactions. If you haven't seen it, go watch it now! It's a personal favourite of mine, and if you must pick only one scene watch the one with the fax machine...enough said. Anyway, getting back on track here. The point is, the extra decimal points seem unimportant and like they wouldn't add up to much. In reality, if you add enough of those decimals together over time, they can become a huge amount of money! Did you know some banks might be doing the same thing with your mortgage payments??? Now, it's not like they're taking your money and absconding(word-of-the-day) with it, but it is something fundamental about your mortgage payment that you should understand and be aware of. If your mortgage professional can't explain this to you in great detail, then it might be worth considering their level of education and/or experience. Depending on your lender, they may choose to either calculate your semi-monthly payment "correctly", or they may choose to simply divide the regular monthly payment in half. The issue with dividing your payment in half is that you are making a larger payment, vs. actually calculating the interest owed with each payment. Assume a $300,000 mortgage at 2.79% interest, amortized over 25 years. This calculation actually costs you more, because it assumes you should be charged the interest for an entire month. Now you might say to me "Ryan, why should I care about this 41 cents??? ", and I would say to you "Mr./Mrs. Client, I care because it's YOUR 41 cents and YOU should decide where it goes and how you use it. Over the average 5-year mortgage term, that adds up to $49.20 in extra payments, and an extra $246.00 over your 25 year amortization. And while your lender should be adding this extra in as a prepayment(thus reducing your amortization by about a month, woohoo! ), wouldn't you rather be in control of where and when you choose to put that extra money??? Going back to what I said earlier, I understand that this may not be a game-changer for everyone. Having said that I also want to make sure my clients best interests are always first and foremost, and knowing the ins and outs of your mortgage interest calculations is not only my responsibility, but also something I take great pride in. So next time someone asks you how you'd like to make your payments, be sure to ask them when and how they calculate those payments and the interest owed. If they can't explain it, give me a call and I will! Hello again everyone! With winter coming on strong and temperatures dropping more quickly than I'd like to admit, I thought it was time that I share a few Fall Home Maintenance Tips. Even things as simple as these minor maintenance tasks can save you from expensive repairs and big headaches over the next few months. Don't make the mistake of overlooking the little things, they become bigger over time! Take care of your hoses and faucets: Disconnect your hoses before the freezing temperatures arrive, because they can cause water to back up in your faucets—and eventually cause the plumbing to crack. Then, if possible, shut off the valves for your exterior faucets. Winterize your lawn mower: Either run the mower dry, or use a fuel stabilizer to prevent the gas in your mower from degrading and damaging the engine. 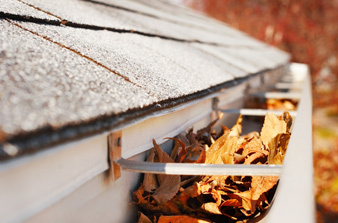 Clean out the gutters/eaves: Twigs and leaves will build up in your gutters throughout the fall. Make sure to clean the gutters before there’s heavy snow, because the weight of both the leaves and the melting snow could cause the gutters to break away from the house. Fixing this later is always more expensive than cleaning them today. Get the furnace ready: Your best bet is to call in a professional to give the furnace a tune up, but at the very least you should change the filters. Your furnace is a very sensitive, finely-tuned appliance and your energy bill will thank you later for maintaining it. Inspect the roof: As snow accumulates and melts from your roof, it can cause major water damage if the roof isn’t in good shape. Look for loose shingles, rust, moss—anything that could lead to decay or water damage. It’s best to be proactive with your roof—repairs can be extremely expensive—so don’t hesitate to call a roofing professional if necessary. It’s worth it in the long run! Stay tuned for more as I continue my ever-expanding list of most recommended maintenance and repairs before we bunker down for winter! When is free not really free? Every day for the last month or so, I've been walking past a major bank branch who has been advertising a 'Free Mortgage Switch'. When I saw the offer, I couldn't help but remember the old saying: "If it sounds too good to be true, it probably is!". With that in mind, I spent some time researching the program and thought it was worth clarifying the small print that goes along with offers like this. Several of the lenders I work with offer a similar program, and almost all of them have some limitations that you should be aware of. Even if the offer includes transfer of some fees, there will be a cap(Usually of $1000-$1500) beyond which you will be responsible for paying the difference. This keeps your new lender from accepting the risk of a transfer that comes with exorbitant fees from your current lender. Always ask questions about the cost of leaving your lender, before assuming that those fees will be paid for. A collateral charge mortgage is registered against your property differently from a standard mortgage, and is often unable to be transferred to a new lender(For more info, click here). While there are some programs to allow a collateral switch, most times you will be required to pay the fees to discharge your old mortgage, and register a new one with your new lender. This discharge/registration process can be expensive and will require the services of a lawyer or notary to complete. There are now some big banks offering up big cash-back incentives when you switch to their institution, and while this could help offset some of the extra fees that might not be covered, it comes at a price. Cash-back mortgage options come with a hefty interest premium, and could wind up costing you a lot more money than you would expect. Carefully compare how badly you might need that cash now, vs. how much the increase in interest will cost you over your mortgage term. Rule #4: Where Has This Thing Been? Today's message is simply this: Always read the fine print, it's rare that a deal which sounds too good to be true actually is. There are plenty of lenders who will gladly transfer your mortgage in at no cost, but you are going to have to meet the criteria they set out in advance. This generally means no collateral charges, very low fees/penalties, and only from a lender with whom they are comfortable dealing. When you're thinking about switching or transferring your mortgage elsewhere, come see me first for a no-cost review of your situation and some good advice about where and when to make the switch. It will not only make the process easier, but could save you a lot of money! Hey tech-savvy homebuyer, look over here! Next time you're out hunting for your next humble abode, stop sketching notes on the back of your feature sheets and start making a detailed gameplan using your smartphone or tablet. With these powerful apps at your fingertips, you'll be well-equipped to tackle even the most ambitious home tours all while being able to retain the information about each home you visit. Best of all, each of these makes it easy to take the information home with you later and compare the listings side by side. If you're looking for a way to make your house hunt less stressful, you've come to the right place! Seeking inspiration? Look no further than this app featuring hundreds of gorgeous home designs in one place. It's like Pinterest, but simplified and concentrated into the best and the brightest in home design. It doesn't have any crazy features or tricks, just a simple way to view some beautiful home designs and get yourself excited for your next design project! Visit their website HERE for more. Since I've gotten myself on the topic of design and inspiration, how could I leave out Pinterest??? This app is addictive, YOU'VE BEEN WARNED! But it does showcase some of the best DIY, home improvement, and awe-inspiring ideas from all around the internet. It allows you to collect and organize your favourite ideas in one place for reviewing and inspiring you later. Buyer beware, I have no sympathy if you download this app and it takes over your life like mine....Check out my boards HERE and Follow me to see what I've been up to! Have any other apps that should have made the cut? Send me a message and let me know if there's something else new and innovative that I should be checking out! Ryan W. Smith - Mortgage Broker - House & Home Mortgage Co. Content should not be relied upon solely as financial advice, please always consult with your financial/mortgage professional in person or contact me @ ryan@ryanwsmith.ca should you have questions. Opinions reflected in this blog are solely those of their respective authors.